Happy Birthday! I get it. Happy Mother’s Day! I get it. Happy Memorial Day? I don’t get it. Whenever I see someone post ‘Happy Memorial Day’ it makes me cringe. It seems like a disrespectful oxymoron. Sure Memorial Day is a day off for many. Sure it’s a day to spend BBQing and rumpusing outdoors with family and friends. Sure it’s a day to catch stale tootsie rolls at a local parade. See above. It’s a day to remember those who died in active military service. What is happy about that? Shouldn’t we be reflective, full of gratitude, or even reverent on this day? Have fun; enjoy your festivities, no one is suggesting you shouldn’t – just think twice before wishing someone a HAPPY Memorial Day. BTW, Veteran’s day is in November. Some get Memorial Day and Veterans’ Day mixed up. Veterans Day honors people who have served in the U.S. Armed Forces (dead or alive). 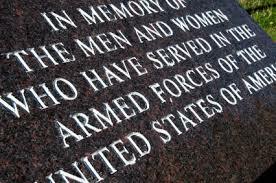 Memorial Day is to remember those who died. While I do not believe those who have passed have the ability to read my blog, I do want to say Thank You to the families of service members who sacrificed their lives. Your loved ones are not forgotten.